Print Power is a superb sign-,banner-,and card-making program for the 8-bit Atari computers. It comes on two Atari DOS 2.5 singledensity format disks (with Commodore 64 versions on the flip side), one for the program and the other for borders, fonts and graphics. It is unprotected and runs great from a RAMdisk or hard drive, under any Atari-compatible DOS, including the new SpartaDOS X cartridge. This ability alone has turned me into a former Print Shop user, eliminating the frustrations of an incompatible disk format and protected software that cannot be backed up. Products from Hi-Tech Expressions have matured significantly over the past couple of years, while the prices have stayed remarkably affordable. Their continued support of the Atari 8-bit computers with high power, low-priced products is certainly a welcome sight in light of the current lack of new productivity software. Print Power comes with 40 different borders to choose from, which can be used in the creation of signs, letterheads and greeting cards. They are suitable for parties, Christmas, St. Patrick's Day and sporting events, among other more general forms. Borders are chosen from a menu by name. It is easy to page through the names with the up and down arrow keys on the keyboard. (You don't have to press and hold the control key when using the arrow keys.) A graphic printout of these borders is on a separate "Design Tools" reference card, which comes with the software package. You need to keep the card handy, since you will not see a graphical representation of the borders on the display. There are 60 different graphical icons to choose from, also printed and labeled on the "Design Tools" reference card. Five different graphic sizes may be selected to fill all, half or one quarter of the page. One-or two-inch (wide) sizes may be chosen also, handy for letterheads. Once the graphic is selected, a flashing box is placed on a representation of the card or sign you are currently building. Arrow keys move the box, and the space bar "anchors" a copy in the desired location. Multiple copies of a single graphic can be placed on a single page, but different graphics cannot be loaded for a single card face, sign or letterhead. In a greeting card, up to four different faces (front, inside left, inside right and back) may be defined. On each card face a different border, graphic and body of text (including none) may be defined. Greeting cards may be created in wide, tall and tent formats. Print Power provides six different fonts for text editing, including Fine Print (a fine typewriter style text), Avante Garde (sans-serif style), Headline (bold courier), Times, Old English and Zapf (a cross between script and italics). While editing your text, many different control-key commands are at your disposal. Special text effects such as Bold, Italic, Outline, Jazz (multiple shadows), Shadowed (outline with shadow) and Raised (outline, italics, with shadow) may be enabled on each line. Each special effect is enabled for an entire line of text; you cannot have two different fonts on the same line. If bold is enabled on a line, the entire line will be printed in bold. Justification can be set to left, center or right. Up to four different fonts can be used in a single design. Cards, signs and stationary allow three different text sizes, while banners can have eleven text sizes. Banners can be up to 42 pages long! When placing text on a page, the editor is smart enough to know when a line of text overruns the current line. A miniature graphical representation of your page and text are shown at the top of the screen as you enter text in a window at the bottom. If the text is too large to fit, your line becomes filled with "shadowed" characters. At this point characters can be deleted, or the font and text effects (such as size) changed to make the line fit. The biggest problem with the text editor is that insertions of entire lines must be done manually. You cannot simply press Shift-Insert to make room for another line. In other words, Print Power's editor is "line" rather than "page" oriented. Generally, signs and cards are rather brief and this isn't too much of a problem. Other nice features of the text editor include a help screen and the ability of "masking" text, which provides a white outline of text when overlayed on a graphics background. Print Power supports a lot of printers. It also includes a printer-driver construction set. Building a custom printer driver requires the assistance of a good printer reference manual and a lot of trial and error. The setup menu provides control of printer selection and testing, as well as memory configuration. The Atari version of Print Power is smart enough to use extra bank-switched memory of XL and XE computers, if enabled. SpartaDOS users can tell Print Power to use only the lower 48K of computer memory, so as not to conflict with the special areas of RAM that SpartaDOS requires. Print Power may directly use fonts and graphics from the Sesame Street Print Kit, and it will modify an Awardware disk, enabling you to use its graphics as well. A utility from No Frills Software called The Converter will allow the conversion of Print Shop icons to Print Power format. (You can even edit Print Power and other graphics with The Converter, something Print Power doesn't allow.) The Converter will be reviewed in ANALOG soon. I don't have any real complaints about Print Power. Its limitations are few. It does not provide a scaled graphical representation of icons and borders, as Print Shop does. But this is a fair trade-off, as noted earlier. With Print Power you cannot edit the graphics or fonts. The Converter from No Frills Software solves the graphics editing problem. 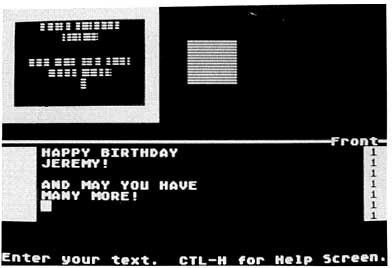 I would like to see a font creator/editor/converter (load and convert Atari custom fonts) to turbocharge Print Power's capabilities. As it is, Print Power is a phenomenal value at only $14.95. The Converter will make thousands of Print Shop icons available to Print Power, if you are concerned about making the move over to this product. Sesame Street Print Kit (also $14.95) is a nifty package in its own right, and will expand the graphic, border and font library of Print Power; an excellent product for young children. Print Power will provide many hours of creative fun for you and your family; I highly recommend it.